8D43 engine, originally intended as outboard gimballed engines for first stage of Proton UR-500 global rocket. 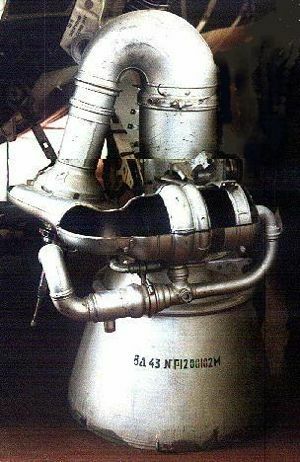 Kosberg N2O4/UDMH rocket engine. UR-500 stage 1 original concept. Hardware. In early Proton design would be clustered with 4 x Glushko 11D43. Abandoned in favor of 6 x Glushko 11D48, but later developed into the RD-0208 and RD-0210. Status: Hardware. Thrust: 559.00 kN (125,668 lbf). Specific impulse: 316 s. Specific impulse sea level: 284 s. Burn time: 115 s.
Low-expansion ratio gimbaled variant developed for UR-500. In initial configuration 4 would be clustered with 4 x Glushko 11D43. Abandoned in favor of 6 x Glushko 11D48. Further developed into the RD-0208 and RD-0210 engines. Thrust (sl): 599.813 kN (134,843 lbf). Thrust (sl): 61,164 kgf. Chamber Pressure: 147.00 bar. Area Ratio: 28.5. Oxidizer to Fuel Ratio: 2.6. Family: Storable liquid. Country: Russia. Launch Vehicles: Monoblock UR-500, Polyblock UR-500. Propellants: N2O4/UDMH. Agency: Kosberg bureau. Bibliography: 273, 320.